TT Red Force’s Jason Mohammed plays a shot during day 2 action of the West Indies regional 4 day match against the Guayana Jaguars at the Queens Park Oval,yesterday. Openers Jeremy Solozano and Joshua Da Silva, both members of the Queen’s Park Cricket Club, combined to put on 84 for the first wicket after starting the day on 13 without loss. Solozano scored 45 and Da Silva fell one short of his maiden first class century. Bowling for Guyana left-arm fast bowler Raymon Reifer was the top bowler snatching 2/32 in 14 overs. Solozano and Da Silva, who survived a tricky period at the close of day one, started day two positively with Solozano leading the way. Solozano, who cracked seven fours in his 89-ball innings, fell leg before to Reifer. 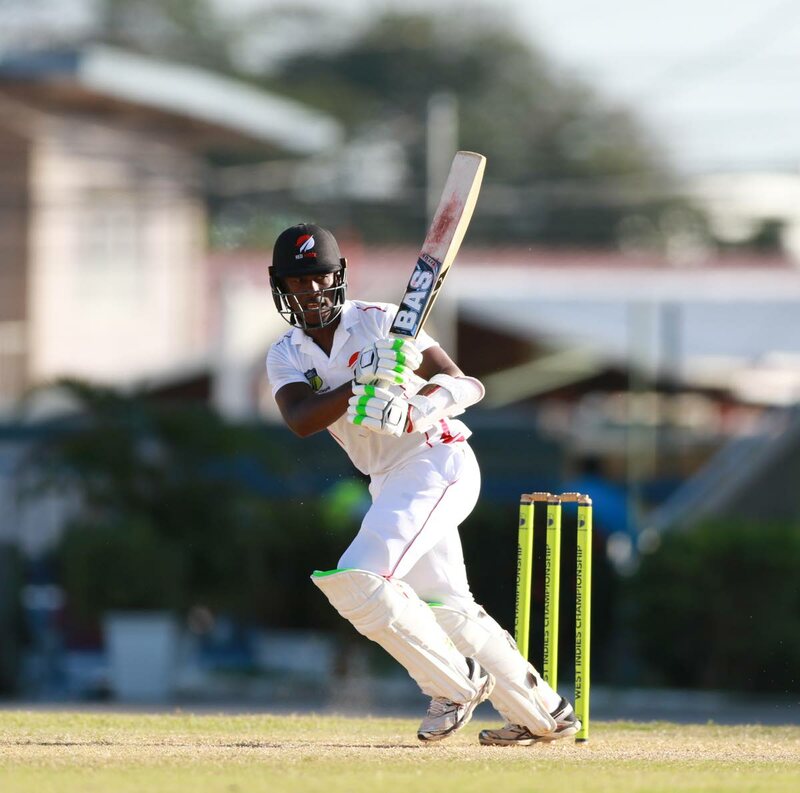 Tion Webster, who scored heavily in the recently concluded UWI T20 Tournament, showed some aggression on his arrival at the crease. Unfortunately, he fell for eight as he skied a delivery to Vishaul Singh at cover attempting to play a shot on the leg side to give Gudakesh Motie the wicket. After TT scored freely in the morning session getting to 107/2 at lunch, the Jaguars fought back in the second session. Red Force captain Denesh Ramdin was dismissed for ten shorlty after the interval when he was bowled behind his back by fast bowler Keemo Paul. Mohammed and Khan, who has also struggled to score consistently this season, shared in an 83-run unbroken sixth wicket partnership. The Red Force scored more than 100 runs in the final session with Mohammed closing on 79 and Khan ending on 40. Day three today starts at 10 am. Reply to "Mohammed shines as Red Force show fight"